Every now and then, one gets a chance to step away from looking at life through a microscope, simply concentrating on daily tasks, and see how they can make a difference on a larger level. In October, my fellow graduate student and I did just that. 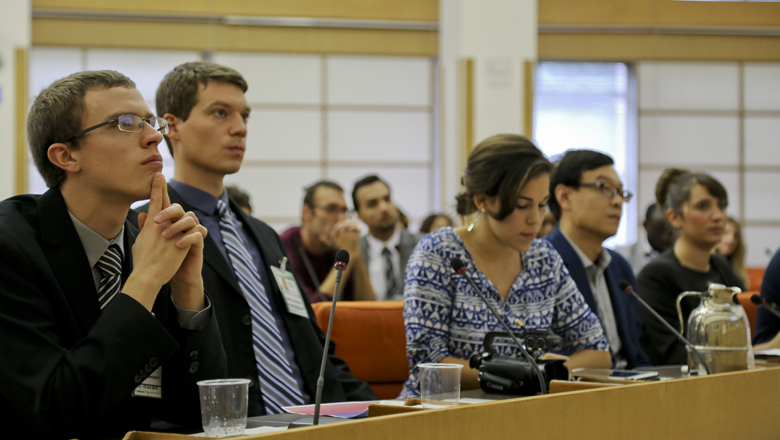 My name is Jeremy Robison, and I am writing this with my fellow engineer David Wilson to share our experiences and takeaways from participating in the meeting of the Committee on World Food Security at UN-FAO headquarters in Rome, Italy. Rome, with all of its rich history, art and gelato, is a beautiful backdrop for a story centered on solving challenges related to food security. “How?” you might ask. As winners of Planet Forward’s Storyfest, David and I were awarded a great opportunity to share our story — the story of the Purdue Utility Platform (PUP). The PUP itself is a multi-purpose utility vehicle that can be built with local materials and tools found in rural Africa. The beauty of this vehicle is that it can be manufactured locally, sold for significantly less than similar vehicles, and can be repaired quickly and easily since local materials and tools are used. This vehicle has the ability to help solve food security problems by making transportation more accessible for people in rural areas of developing countries while providing additional utility by powering attachments and implements. With this innovation, farmers can transport people and goods faster, farther and more affordably. This is a big deal because often the majority of roads are unpaved and there are severely limited options for motorized transportation. Additionally, people in rural communities can use attachments and implements like water pumps, maize grinders, threshers, belt driven generators, planters and wagons. The PUP is a great story to tell, and David and I love to share it. It's been fantastic to see how people have come together to make this project a success. We work with a great local partner in Cameroon called ACREST (African Centre for Renewable Energy and Sustainable Technologies) to implement the PUP in a rural area of the country. Every year, students from Purdue University travel to work with ACREST to implement the designs they have been working on. And the project has now led to an opportunity for the PUP to also be built in Uganda at Makerere University. The PUP has been an exciting story to be a part of, and the Food Security conference provided a great opportunity to share that story while also learning a tremendous amount of information. We found the plenary and side events in these areas to be the most useful: the power of storytelling, the need to empower youth, the need for more young people to engage in agriculture, the problems stemming from climate change, and the need for sustainable soil management. These topics resonated with us as our generation prepares to take on the challenge and responsibility of feeding the world’s ever growing population. But the biggest takeaway David and I both had from the conference was learning the importance of coupling innovations with the art of telling a story. As engineers, we have worked hard toward bringing the PUP into a tangible existence in Cameroon, but its impact as an idea can only go so far without communicating that idea to other people. That’s why the story behind the project has so much importance. Storytelling has brought the PUP from being a fun engineering project to a scalable transportation solution. This conference left an impact on both David and me as it has both empowered and challenged us to respond to the ever looming challenge of global food security. We need young people to respond to this call. We need people to work as a multidisciplinary group of problem solvers and storytellers. We need good stories. After all, who doesn’t like a good story?